Jenn has been working with Fresh Collective for many years now, and I’m impressed to see her passion, drive and dedication unfold over the years. A savvy businessperson, Jenn is equally creative and committed to shaping a new future for fashion with her eco-friendly fabrics and environmentally conscious methods. Jennifer Fukushima is a shining light in the Toronto fashion industry, and an example to emerging designers of what passion, hard work and commitment can bring. I’m proud to have been able to play a part in Jenn’s career all these years, and I am very excited about the future this talented young woman is creating. What’s a typical day like for you? It really varies depending on the time of year. I spend certain times of the year designing, developing products and production, other times of the year I have a lot of trade shows and sales. I met Sophia last year, when she sent us a picture of herself performing in a Paper People Clothing dress similar to the one she is modeling here. We chatted a bit through Facebook several times about various things and just got to know each other through there. 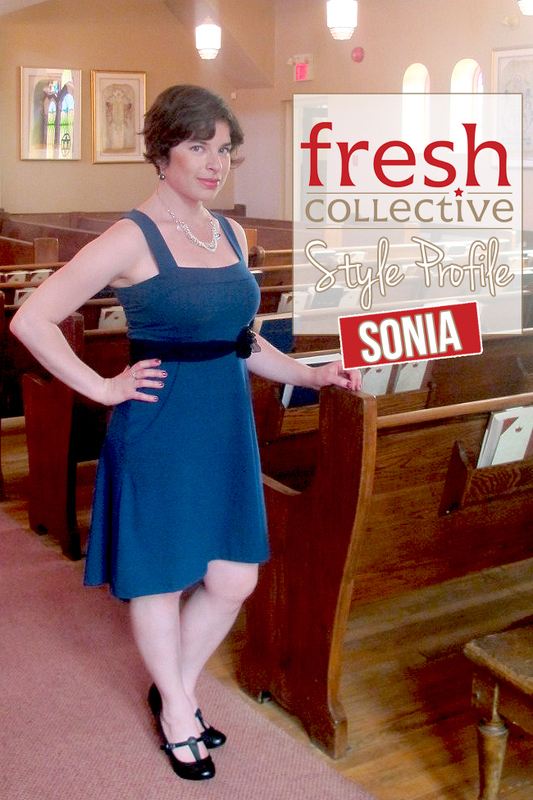 She told me how much she LOVES Fresh Collective, and how she has bought a lot from us over the years, and it just seemed a natural match to feature her as a Style Profile model, especially given the launch of her tour! Make sure you check out this lovely lady at a gig near you soon! Lifestyle: Always on an adventure of some kind. What’s a typical day like for you? A typical day means that it wasn’t anything like any other day I’ve had, and will probably not be like any other day to follow! Some days I’m performing, other days I’m teaching (everything from Kindergarten to College), or living my double life as my own booking agent/manager/publicist. Rare days are the ones where I get to hide out at home and practice or work on my songwriting – when the weather’s nice, I’ll take Tallulah – my precious junk-shop rescue accordion out and find somewhere outside to sing and practice (which I think my neighbour upstairs much prefers to my staying home!). Most days will be a combination of some or all of the above. I have a hard time keeping still at the best of times. Luckily my husband Adrean, who is also a musician, is really grounded and patient and into doing things one at a time. He helps me remember to slow down and keeps me grounded! I met Michelle Planche last year when I was a judge in the Art of Fashion competition for emerging designers. Michelle is passionate about providing opportunities for designers, as am I, so we were a natural partnership. We created a project together- a seminar called the Retailer’s Point of View and The Ultimate Holiday Dress Competition. Michelle and I also serve on the board of Fashion Group International together. I met Sonia through Evan Malach, who is the creator of the play, “A Simple Twist of Fate” where she plays The Fiddler. I met Evan because I was driving up Augusta Avenue in Kensington Market one day and I saw a wallet that looked freshly dropped. I pulled over and picked it up, did a little googling and tracked down its owner who was Evan. We chatted and he told me about the play, which is being put on in a gorgeous synagogue just down the street from the store, so we thought it was a great connection to promote his play on the Fresh Collective Style Profile. Sonia was a delight to work with, and everything she put on looked great! It was hard to narrow it down to just 3 outfits to showcase! What’s a typical day like for you? I like to make my days a balance of work, fitness, and socializing / community engagement. The summer is the best time to do all three! As a freelance violinist, I’m in charge of my own schedule – but that doesn’t mean I don’t have the responsibility to do a certain amount of work each day. If the night isn’t too late (sometimes I don’t get home ‘til 12 or 1am after a concert), I wake up before 8 and go for some type of workout. If there’s time, I try to squeeze in a short meditation before getting on with my day! Then, I love to head to a cafe for some social networking – work e-mails, business calls, updating social media sites, etc. These things are a huge part of my life as I’m constantly expanding my professional network, which is essential for a freelancer. After lunch is when I get the bulk of my work done: practicing violin, going to rehearsals, editing new musical ideas, and the occasional meeting. This is when I feel the most inspired and productive! In the evenings, I either go to a concert (my own, or a colleague’s), or out with friends – though during very busy music seasons, more practicing and rehearsals. Of course, all of this can change in a heartbeat during orchestra season (September to May) – days become packed with rehearsals, traveling, and more practice! What in your life is really important to you? Music – namely, violin, staying in shape musically, keeping all parts of my work balanced. Also, learning – musical, spiritual, social. Also, I’ve been blessed with an amazing circle of family and friends, which is an element I intend to cherish and maintain – the people closest to me make me happy and I would do anything to make them happy in return. What would you like to be remembered for? My smile, my energy, and shining a light into any one person’s life. What role does fashion play in your life? Well, I hardly thought about it until I moved to Toronto in August 2012! Recently, fashion has really changed for me – expectations are different, and people here are more fashion-conscious than they are anywhere I’ve lived in my adult life. As a woman, I feel like my outfit says a lot about me – simple, confident; or sophisticated; complex, casual, or high-maintenance. I think it’s a power to effect how people perceive you – like it or not, it’s the first impression people get! It’s been a bit of an experimenting trip for me. 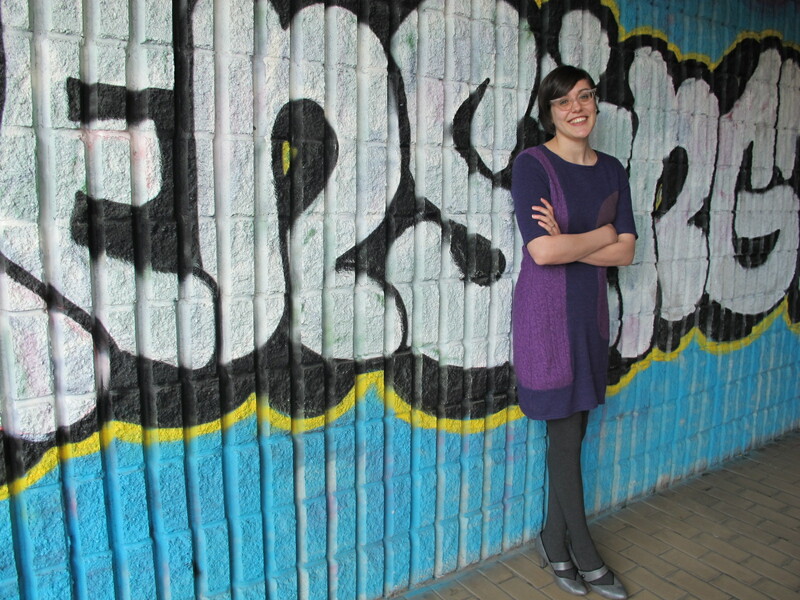 Want to have fun rediscovering fashion and learning what looks best on you? Book our complimentary Perfect Fit Wardrobe Makeover today! Our Fresh Collective Style Coaches will style you up from head to toe in outfits that suit your figure, your colouring and your lifestyle! Let Fresh Collective make shopping a breeze for you! What do you love about shopping at Fresh Collective? I love how the salespeople are so friendly and helpful! All the colours of the outfits are amazing, and they really bring out the character of the person wearing them – as well as encourage us to take risks; try something new that perhaps we didn’t consider before. The dresses are great for many occasionals and are super comfortable – definitely on my list of stores to return to very soon! What are you up to these days? My music, to add a spark to any occasion, or give special concerts! I’m classically-trained, so lots of my work is with classical music – Bach, Mozart, Tchaikovsky, Brahms .. but I love touching the community through other musical styles, such as Klezmer, traditional Jewish tunes that people haven’t heard in years, movie music from the 30’s, the Beatles, contemporary popular songs, and that’s just scratching the surface. This July, I’m involved in a musical production for the Fringe Festival, called A Simple Twist of Faith – please check out the details below! This summer, the Kiever Shul, a synagogue in the heart of Kensington Market, will be home to one of the most compelling new shows at the Toronto Fringe Festival. A Simple Twist of Faith is a heartfelt musical that tells the story of a Jewish American soldier during World War One whose experience in a German synagogue changes the course of his life. Audiences are treated to a mobile experience through the historic Kiever Shul in this innovative piece of Site-Specific theatre. The musical features some of Toronto’s finest musicians and shares an unforgettable story not to be missed. Just in time for the beginning of the hundredth anniversary of The Great War, this is a must-see Fringe show that will uplift and inspire. 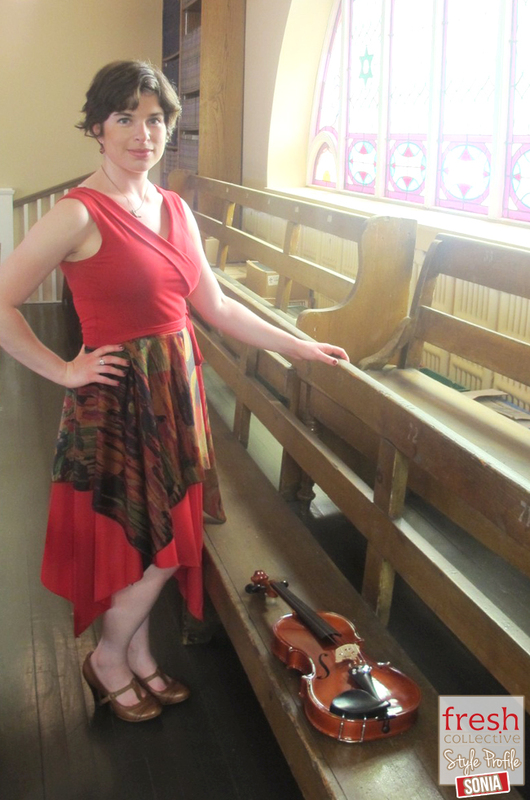 *Sonia will be playing the role of the fiddler, a mystical pied piper type who leads audiences around and through the historic building with her captivating violin playing. Any patrons who come see the show, visit the merchandise table, say you came because of Fresh Collective Style Blog and receive the Official Cast Recording of the show at a discount. **Please note that there is absolutely no latecomer seating. Purchase online: fringetoronto.com | By Phone: 416-966-1062 | In Person: At the Festival Box Office (581 Bloor St W). Join us on Facebook! ::Check out our CJN Article! Hope to see you at The Fringe! 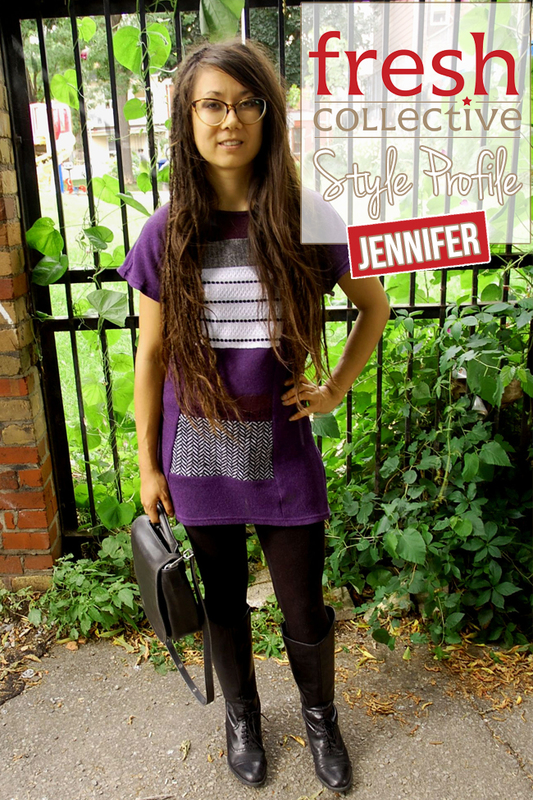 Our Style Profile series is where we feature some of our fabulous outfits in real life, on real women. In the second edition of our style profile series, Melanie lets us in on her life, her thoughts on style, and how she rocks her favourite Fresh Collective pieces. 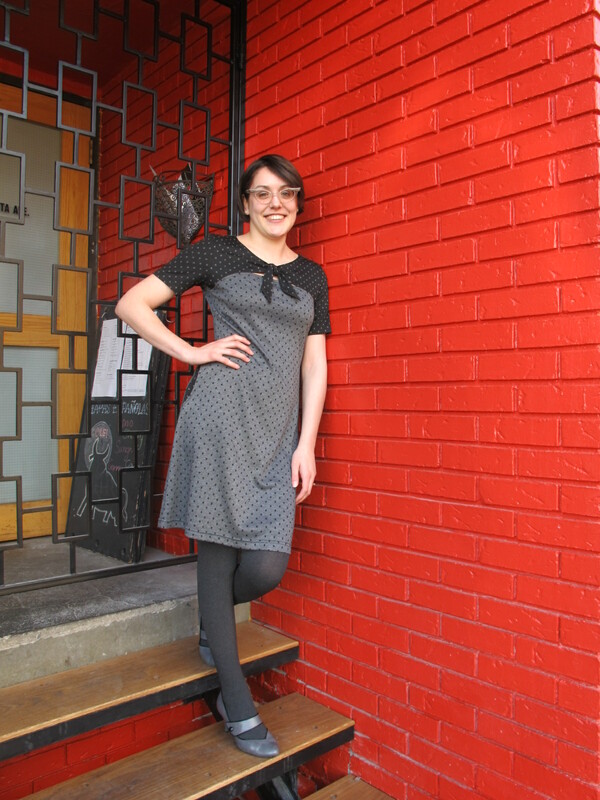 Melanie is wearing the Carlaw Dress by Address Apparel: Now at 40% off it’s $78 (normally $130!) The cute shoes featured in all the images are Melanie’s own! What in your life is important to you: Family, every member of it, and including friends who are pseudo family. What would you like to be remembered for: Being there for people when they need me. What role does fashion play in your life: It’s a part of my personality. 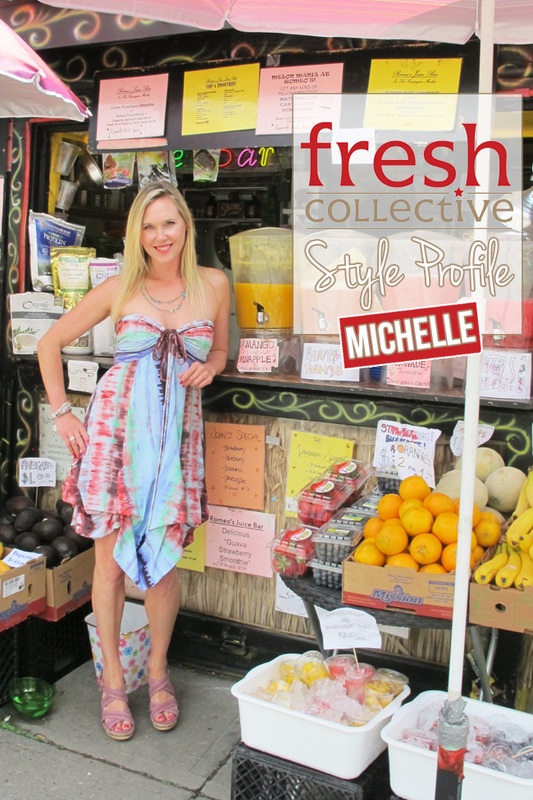 What do you love about shopping at Fresh Collective: The clothes of course! The people who work there are also lovely. Stella Sweater Dress by Paper People Clothing; regular price was $169, now at 40% off it’s $101.40! Do you ever feel like your wardrobe has a split personality? You have your generic office wardrobe. It allows you to fit in and look professional. It serves a purpose. Then you have your real life clothes. The ones that feel good when you put them on and help you to express who you truly are. They make you stand out rather than fit in. Uniqueness and wearability – This is a delicate balance. Creating “unique” garments is always fun for us designers, but if it’s not down to earth enough, the versatility is limited. Loud prints, short skirts and excessive fabric are not work appropriate for most people. Comfort & function – This is a big one, and can easily get lost in the creative process. So it looks good, but how does it feel and function? Is the garment too constrictive to move in or is there excess fabric that gets in the way? Can the wearer perform everyday tasks? Left: Meaghan is all ready for a lunch meeting. She pairs her Elaine Vest with a silk blouse and grey slacks. Right: Jenn is cute and casual, pairing her Elaine Vest with a whimsical lacy long sleeve top and floral print cords. Paper People’s Elaine Vest is the perfect fusion of quirky yet office appropriate. The suiting, collar and welt pocket detailing are classic and timeless, but the asymmetric cut, curved hemline and sweater fabrication update the look and add some personality. 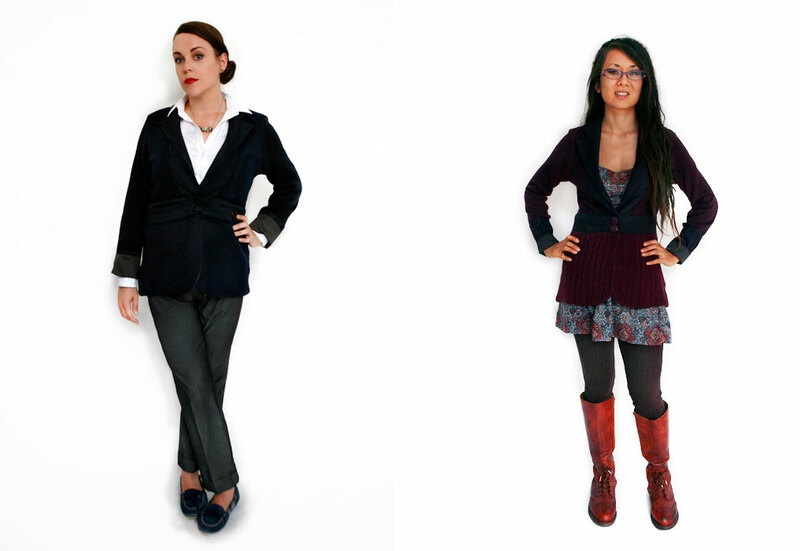 Left: Meaghan uses a cute, cropped blazer and lace up shoes to transition her look to the office. Right: Jenn layers up with textured scarves, tights and boots, creating a bohemian look. 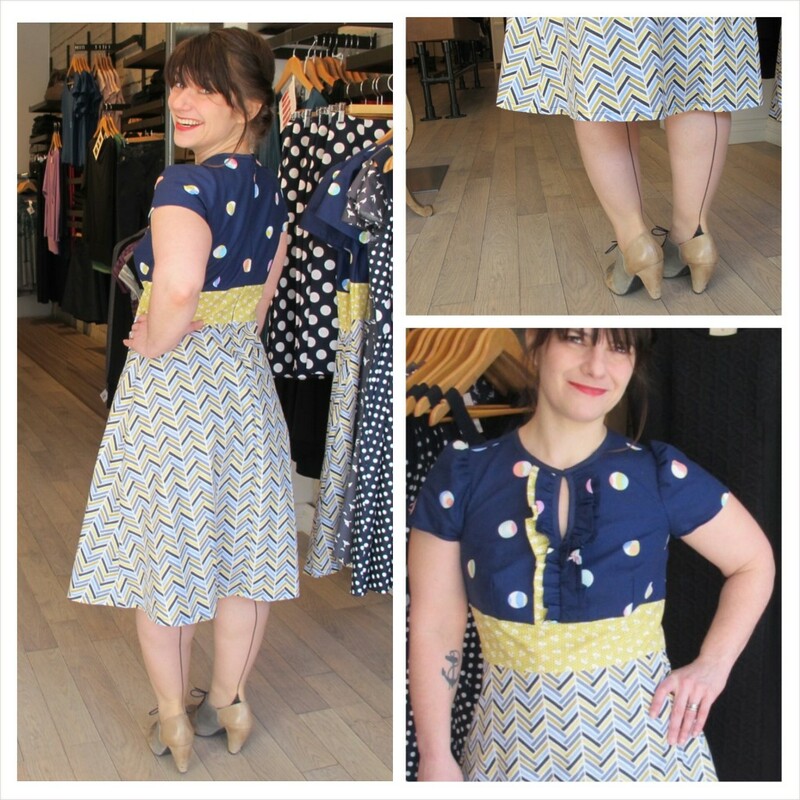 Paper People’s Jacqueline Dress is another fun yet versatile piece. This dress provides enough coverage to be work appropriate and the generous drape of the skirt and stretchy fabric allow for plenty of comfort and movement. Left: Meaghan is ready to seal the deal. She pairs her Maude Blazer with a traditional button down shirt and grey slacks for a polished, professional look. Right: Jenn just wants to have fun. She layers her Maude Blazer over a paisley mini dress, cable knit leggings and knee high riding boots. Paper People’s Maude Blazer is a favourite for many and there’s no question why. This piece fuses a crisp, classic suit detailing with comfy sweater fabric to create a polished yet versatile look. I hope we’ve demonstrated how transitioning from office to real life isn’t that hard at all. It’s all about choosing unique yet versatile pieces. Come visit us at Fresh Collective today for a wardrobe makeover. We promise that with the addition of a few of these key pieces you’ll look forward to getting dressed for work in the morning. 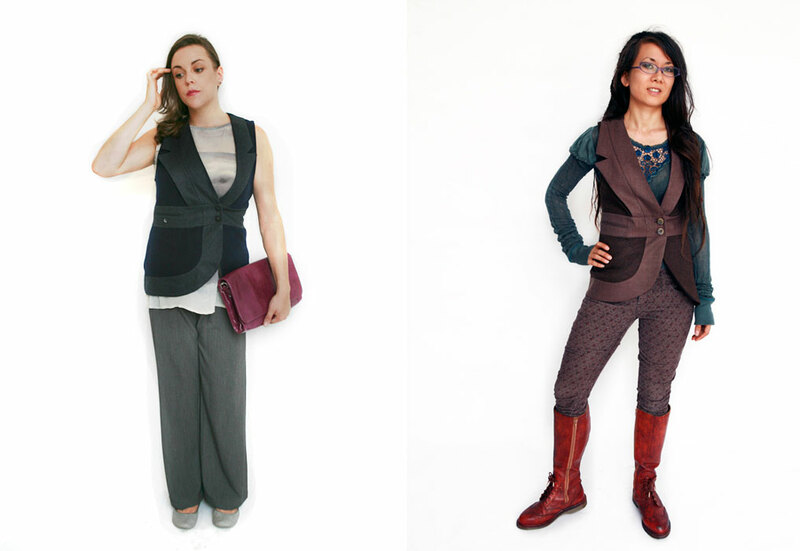 The Elaine Vest is available at Fresh Collective Roncesvalles and Fresh Collective Queen. The Jacqueline Dress is available at Fresh Collective Queen and Fresh Collective Kensington. The Maude Blazer is available at all 3 Fresh Collective locations. See all of the Paper People Clothing 2013 Fall Winter Collection here! As the summer comes to a close, we’re busy, busy, busy in both my businesses, preparing for the season’s changes. Dexter, my almost seven year old son, is going back to school planning his birthday, and we’ve had one last weekend at our friend’s cottage as it’s officially September! 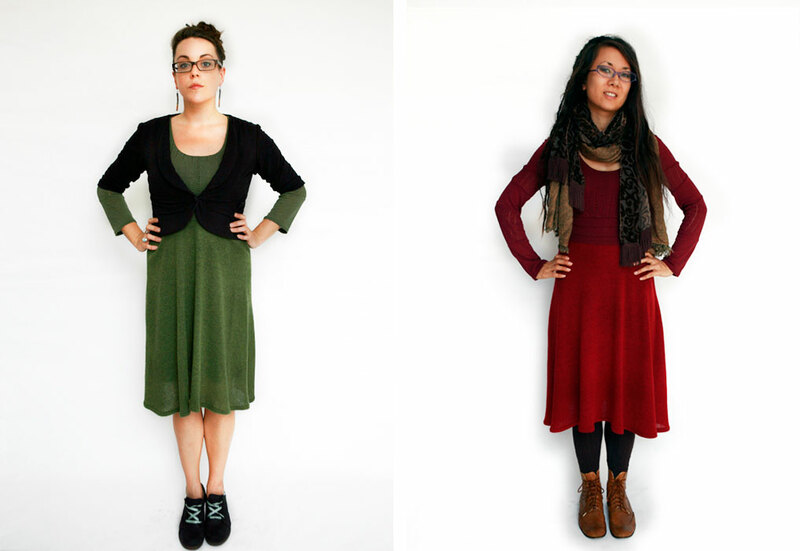 With September comes the seasonal what to wear dilemma! It’s cool in the morning and warm in the afternoon. Evenings are chilly and we want to look put-together and feel great. Lately I’ve been relying on our fabulous store staff to be my personal shoppers. The say it takes a village to raise a child. Well, it seems it takes a staff to keep this busy lady looking polished and great everyday! 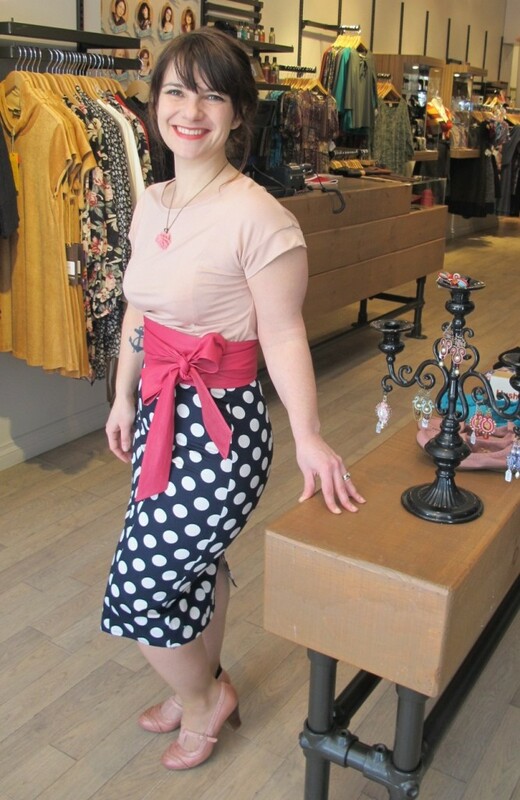 Our store staff are fashion experts – they know my style, my shape as well as what I like. When I plan to come by, they pre-stock the changeroom for me. It makes shopping a breeze, and often I try things I wouldn’t normally try, and I’m pleasantly surprised. When accessories that come in that help me get more looks out of the pieces I have, they send me a snapshot and ask if I’d like it held to pick up when I come by next. I feel like a pampered VIP and you know what, you can too! This personalized service is available to any customers who ask. Our staff is thrilled to be able to select things and suggest them just for you. Our business is all about matching up the wonderful pieces we carry with the fabulous ladies who may not have the time in their great and busy lives to spend a lot of time shopping. For fall, I’m stocking up on the great cardis, wraps and accessories we’re receiving every day. This is an easy way to transition my summer dresses to fall while the weather is still warm, and I can layer and unlayer as needed throughout the day. 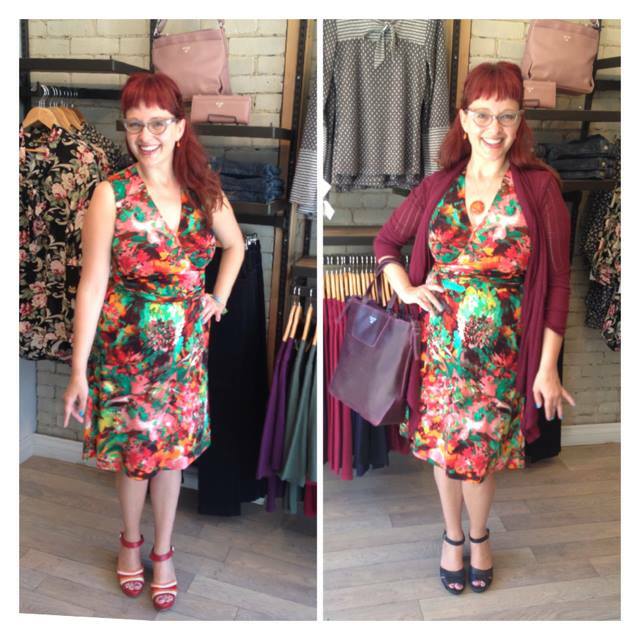 Here’s my fall transition, based around my summer Address Apparel Richmond wrap dress (now $90.00), and Miz Mooz Cherry shoes (now $75.00). Add Yvonne Cardigan from Paper People Clothing in Burgundy ($149.00), a new Mat and Nat Alter Vintage bag ($150) and new shoes; Miz Mooz Sundown (now $93.00), and you’re ready for fall! Joe and Aimee at Fresh Collective Roncesvalles suggested this for me, and I think they made a fabulous choice. Don’t you? This cardi will go with so many dresses and skirts I already own, and be that perfect versatile layering piece. In fact, I might need to pick up a couple more colours!